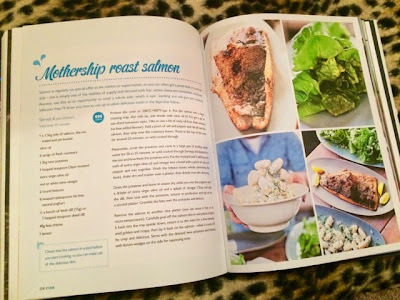 If you’ve ever taken the time to have a little browse through the Tried & Tested section of my blog, you may have noticed that I’m a fairly big fan of Jamie Oliver cookbooks. I own a fair few myself but brought Save With Jamie for The Boyfriend lat year and have finally had the chance to steal it from him so I can try some of the recipes out myself. I was cooking a nice family dinner for my Dad’s birthday and I fancied doing something a bit different. His birthday is 4 days before Christmas so I try to avoid the traditional roast but often I’ll do a nice big pie or do a Greek style roast lamb with lots of Mediterranean bits as a sort of mezze. As much as he loves these I thought doing something new would be a bit more special/thoughtful and that’s when I decided to do a side of salmon. During the build up to Christmas I’d seen loads of recipes for a side of salmon and numerous things to do with it and had been wanting to cook with one for a while as I had only ever cooked salmon fillets before this. I remembered seeing Jamie cook this recipe on the Save With Jamie series and promptly dug it out to give it a go. I thought this recipe made a great alternative to a roast dinner. It has the same sort of impressive impact when you present the roast side of fish as it would putting a roast joint of beef in the middle of the table and with a selection of yummy sides it appears to be just as much of a feast. The potato salad (using yoghurt rather than mayonnaise) alongside the salad, may sound like unexciting side dishes at first but with the addition of some really tasty dressings and the crumbled feta that Jamie uses they transform into something really exciting. 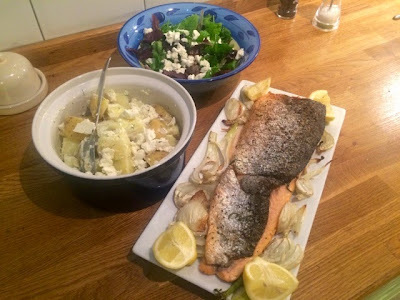 I did add to the recipe slightly and roasted some fennel alongside the salmon as I had some in the fridge and it seemed like it would accompany the rest of the dish perfectly. The salmon itself was so easy to cook and much less time consuming and labour intensive than a more traditional roast joint of meat but just as flavoursome and delicious. I loved the idea of removing the skin and returning it to the oven to crisp up to be used as a garnish as the skin packs so much flavor but is often discarded when not cooked properly. Let’s face it, no one likes horrible slimey fish skin, but when you manage to get it really nice and crispy it’s one of the best bits. This dish made a really nice change for my family as it’s really different from the usual type of thing we’d all sit down to eat together on an occasion but it went down so well. It was lighter than doing a normal roast dinner and much quicker and easier. 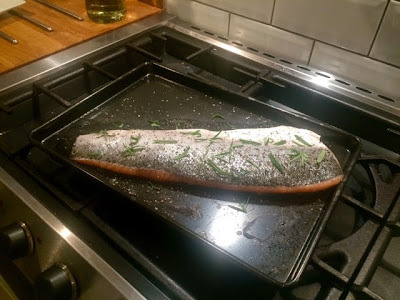 I’ll definitely be buying a side of salmon to use more often in future as it’s more economical than buying individual salmon fillets which can be quite pricey. It’s also the sort of thing you can get a really good price on if you keep your eyes peeled for a deal in the supermarket.